Detailing the physical features, habits, territorial reach and other identifying qualities of the Five-Spotted Hawk Moth. 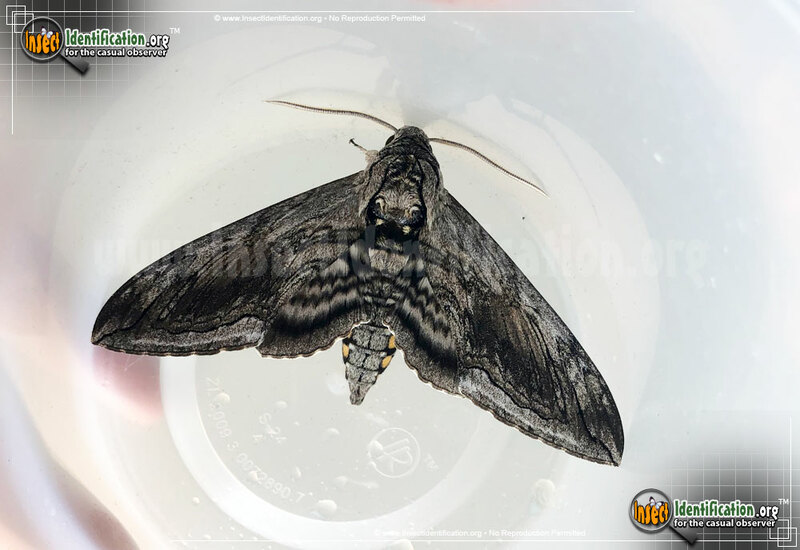 The Five-Spotted Hawk Moth is a large, strong flier that has a reputation for laying waste to fields and gardens trying to grow popular vegetables. 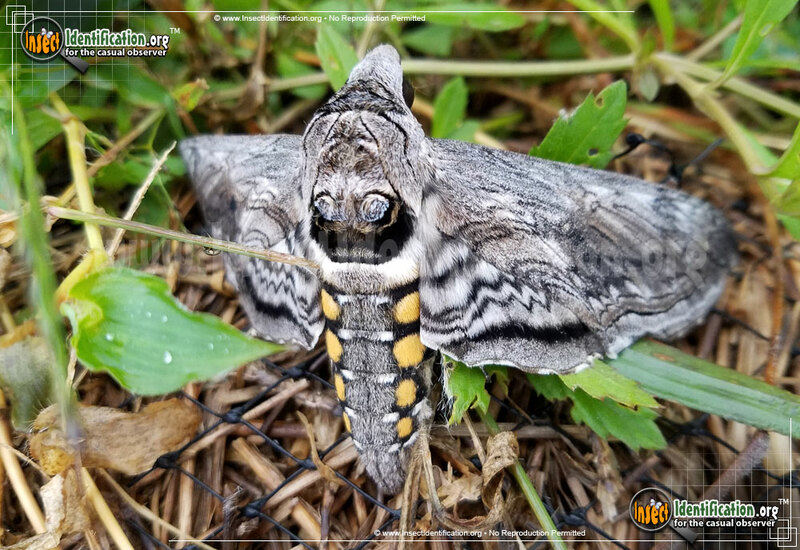 When wings are flat and the abdomen is revealed, two vivid blue eyespots are visible on the thorax of the black, white and gray Five-Spotted Hawk Moth. The five yellow-orange spots that dot the abdomen on each side (10 spots total) are large enough to see and easily count. Sometimes, a sixth spot is present which can confuse those trying to identify them. This large moth drinks nectar from flowers like petunias, honeysuckle and phlox. The adults fly at sundown and are seemingly harmless. Their larvae are another story. The caterpillar (larva) of the Five-Spotted Hawk Moth is a nuisance to agriculture. It is called the Tomato Hornworm. Don't be fooled by the name; this caterpillar eats more than tomato leaves. They have voracious appetites and also eat the leaves of potato, tobacco, and other plants in the Solanaceae family. The green fleshy body almost fluoresces and it has a single black needle-like spine (also called a horn) at its rear. Eight V-shaped marks line both sides of the body. This is different from the caterpillar of the Tobacco Hornworm Moth which has 7 angled slashes on its body. The Five-Spotted Hawk Moth caterpillar -Tomato Hornworm- is well camouflaged among the bright green leaves of tomato plants. Removing a large percentage of the plant's foliage in just a day or two allows the Tomato Hornworm to plump up rapidly. It also weakens plant production and health. Tomato Hornworms pupate and overwinter, emerging in the spring as winged adults. Removing the caterpillars by hand or with insecticides, or preventing adults from laying eggs on the host plant by using row covers can help limit harvest loss each growing season.